For other uses, see Good Shepherd (disambiguation). The Good Shepherd (Greek: ποιμήν ο καλός, poimḗn o kalós) is an image used in the pericope of John 10:1-21, in which Jesus Christ is depicted as the Good Shepherd who lays down his life for the sheep. Similar imagery is used in Psalm 23. The Good Shepherd is also discussed in the other gospels, the Epistle to the Hebrews, the First Epistle of Peter and the Book of Revelation in references to Jesus not letting himself lose any of his sheep. 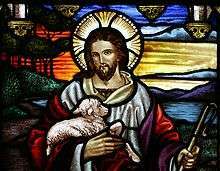 In the Gospel of John, Jesus states "I am the good shepherd" in two verses, John 10:11 and 10:14. I am the good shepherd. The good shepherd lays down his life for the sheep. He who is a hired hand, and not a shepherd, who doesn't own the sheep, sees the wolf coming, leaves the sheep, and flees. The wolf snatches the sheep, and scatters them. The hired hand flees because he is a hired hand, and doesn't care for the sheep. I am the good shepherd. I know my own, and I'm known by my own; even as the Father knows me, and I know the Father. I lay down my life for the sheep. I have other sheep, which are not of this fold. I must bring them also, and they will hear my voice. They will become one flock with one shepherd. Therefore the Father loves me, because I lay down my life, that I may take it again. No one takes it away from me, but I lay it down by myself. I have power to lay it down, and I have power to take it again. I received this commandment from my Father. Allegory of Christ  as the Good Shepherd, 3rd century. Jesus Christ is also compared to a shepherd in Matthew 2:6, Matthew 9:36, Matthew 25:32, Matthew 26:31, Mark 6:34, Mark 14:27, John 10:2, Hebrews 13:20, 1 Peter 2:25, 1 Peter 5:4, and Revelation 7:17. Several authors such as Barbara Reid, Arland Hultgren or Donald Griggs comment that "parables are noticeably absent from the Gospel of John". According to the Catholic Encyclopedia article on Parables: "There are no parables in St. John's Gospel" and according to the Encyclopædia Britannica article on Gospel of St. John: "Here Jesus' teaching contains no parables and but three allegories, the Synoptists present it as parabolic through and through." These sources all suggest that the passage is better described as a metaphor than a parable. 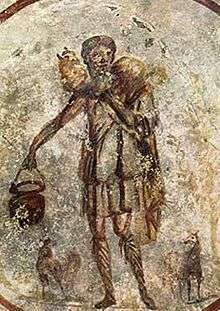 The image of the Good Shepherd is the most common of the symbolic representations of Christ found in Early Christian art in the Catacombs of Rome, before Christian imagery could be made explicit. 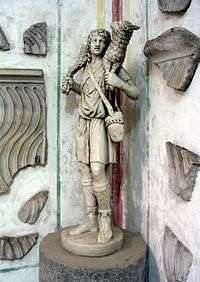 The form of the image showing a young man carrying a lamb round his neck was directly borrowed from the much older pagan kriophoros (see below) and in the case of portable statuettes like the most famous one now in the Pio Cristiano Museum, Vatican City (right), it is impossible to say whether the image was originally created with the intention of having a Christian significance. The image continued to be used in the centuries after Christianity was legalized in 313. Initially it was probably not understood as a portrait of Jesus, but a symbol like others used in Early Christian art, and in some cases may also have represented the Shepherd of Hermas, a popular Christian literary work of the 2nd century. However, by about the 5th century, the figure more often took on the appearance of the conventional depiction of Christ, as it had developed by this time, and was given a halo and rich robes, as on the apse mosaic in the church of Santi Cosma e Damiano in Rome, or at Ravenna (right). 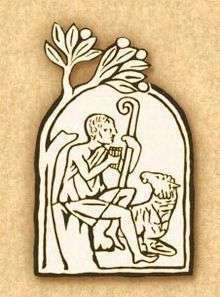 Images of the Good Shepherd often include a sheep on his shoulders, as in the Lukan version of the Parable of the Lost Sheep. Wikimedia Commons has media related to Good Shepherd. ↑ Lowrie, Walter (1947). [https://books.google.com/books?id=0fwCGTzbMQ0C&pg=PA69 Art in the Early Church] Check |url= value (help). Pantheon Books. p. 69. ISBN 1-4067-5291-6. Holman Bible Dictionary - "Shepherd" for other Biblical references. Online IMAGE Collection of the Good Shepherd.